Same type of trading range as yesterday with a mild upward bias. The resistance just above 154.5 could soon turn to a higher target, but there isn't much energy left right now. Note that the 156.25 target is now visible. Entropy is still quite high, albeit very slowly declining. AdStoK is giving a last bout to reach very overbought level without lines crossing just yet. This is a bullish situation (high prob). One can only expect its continuation i.e. slow steady increase, at least until AdStoK lines cross (July highs?). Entropy at 3 is historically very high, so a slowdown (rate of increase) is almost certain. Next target is just above 156. 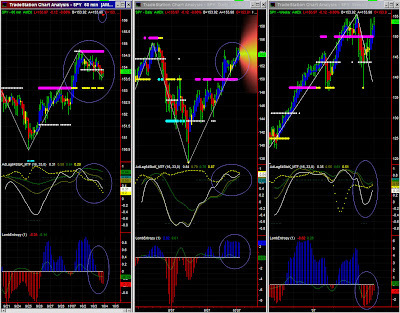 The Swing indicator is again hesitant as it is up again, confirming we are close to a key level at this time frame. AdStoK is still bullish but showing signs of slowing on this 829 level, and Entropy has lost all its steam in about a day and a half. A support level must be found now around yesterday's lows or maybe around 820. 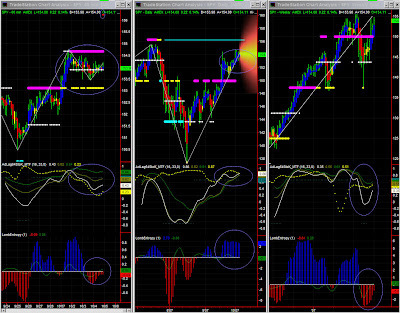 Note that MM levels have aligned to daily ones, i.e. strong MM resistance level at 875. 812.50 is now a strong support level. The next levels are 829 (still valid, but minor), 843 (stronger) then 860 and ultimately 875. 60mins: possible hesitation until new resistance level at 2125. AdStoK is very bullish with an undecisive white line following cycles and now going down indicating a pause to minor retracement (strong support at 2094). The reason is that after such a strong bull run, NDX has been stopped onthe MM stall level, ahead of the (too) expected MM resistance level. NDX will besiege and almost certainly conquer 2125 as the overall trend remains up. Note however that significance level is low indicating one should focus on a higher time frame. Daily: mildly UP. 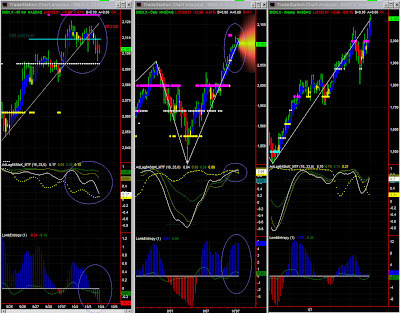 Possible congestion or slowdown on coming resistance, due to extreme overbought situation. AdStoK and Entropy showing mild signs of weakness, SPY will be looking for support within this narrow trading range, around 153.50 or closer to the MM pivot. It probably won't go lower as the entropy could already bottom shortly and the AdStoK's green line has a very shallow gradient. Range highs could be tested again. 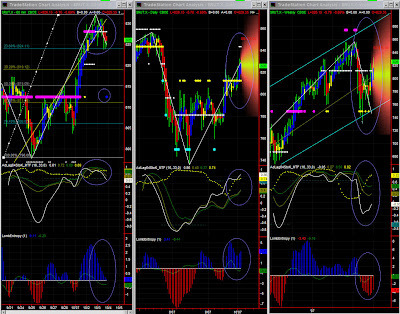 Note that significance level at this time frame (yellow dots) is dropping though. Entropy is now stable at a high level, and AdStoK is giving a last bout to reach very overbought level without lines crossing. One can only expect continuation of the same situation, i.e. slow steady increase, at least until AdStoK lines cross (July highs?). Entropy at 3 is historically very high, so a slowdown (rate of increase) is almost certain. The Swing indicator is certainly hesitant as it is down again, indicating we might be close to a key level at this time frame.